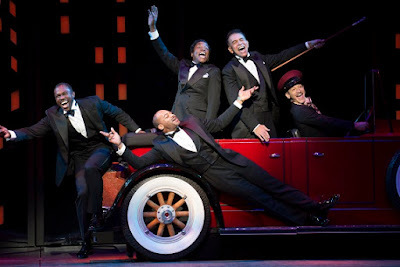 Joshua Henry, Brandon Victor Dixon, Billy Porter and Brian Stokes Mitchell, with Richard Riaz Yoder in a scene from "Shuffle Along, or The Making of the Musical Sensation of 1921 and All That Followed." Photos by Julieta Cervantes. THERE'S a lot of shameful history – past and present – in the way America has treated its so-called minorities. In "Shuffle Along, or The Making of the Musical Sensation of 1921 and All That Followed," in an open run at the Music Box Theatre, George C. Wolfe (direction/book) looks to put some of these inequities in a Broadway context, or at least it is presumed he does. His story is centered on a hit show that was produced by an all-black production team in 1921. While celebrating this achievement, GCW's plot aims to shine a light on some of the injustices stage performers of color suffered. My anticipation was that the drama of this premise would provide a stirring tale. Unfortunately, the earnestness of the GCW's story is engulfed and then overshadowed by an entertaining vaudeville. Nominated for 10 Tonys, "Shuffle Along ..." is episodic, in parts reprising snatches of the '20s show – originally titled "Mayor of Jimtown" – and backstage love stories. Rehearsal scenes and occasions when new material is created abound. Somewhere in all this backstory, the poignancy of GCW's "Shuffle Along ..." is lost. The 1921 musical was not a revue, which was unusual for the time. It had a cockamamie story, but a story nonetheless. It also featured several love songs, including "I'm Just Wild About Harry and "Love Will Find A Way." "Shuffle Along," the original, was written and produced by Aubrey Lyles (Billy Porter) and F.E. Miller (Brian Stokes Mitchell) and the composer/lyricist team of Eubie Blake (Brandon Victor Dixon) and Noble Sissle (Joshua Henry) . The impecunious James Cort (Brooks Ashmanskas, who also plays all the other white roles) provided the production with a theatre. The show ran for 504 performances at the 63rd Street Music Hall. Lyles was right to object that this address was not Broadway, but "Shuffle Along" got a Broadway welcome. It attracted integrated audiences and ushered in an era of other successful black shows. The syncopated dances created by choreographer Savion Glover for the reincarnated production are masterful. That everyone from Audra McDonald to BSM and BA get to tap is one of its joys. The company astounds as it dances out a long rail trip of tryouts as it taps from city to city. AMcD is the ingenue/star as Lottie Gee, but it's Adrienne Warren as Florence Mills/Gertrude Saunders who is one of the highlights of the show. Also outstanding in the fine cast is BVD's sweet and sensitive Blake, a man caught by ambitions he never thought he could achieve. 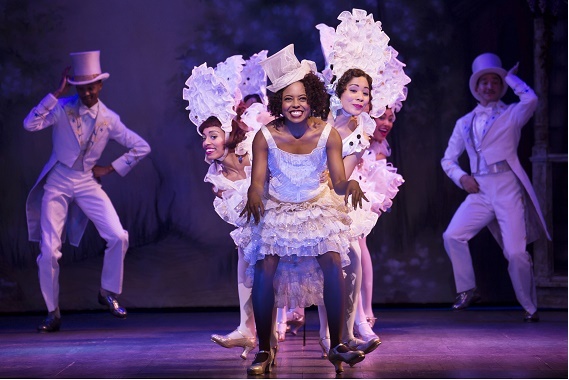 Adrienne Warren, with company, gives a standout performance in "Shuffle Along ..."
The Broadway of 2016 owes a debt to the innovations that the "Shuffle Along" team brought to musical theater in that historic season of 1921. Much of the style and flair of that production inspired, even revolutionized, Broadway. And by way of flattery, "Shuffle Along's" syncopations and jazzy rhythms were widely imitated by the likes of Ziegfeld and other mainstream producers. Visit http://www.shufflealongbroadway.com/ to learn more about "Shuffle Along, or The Making of the Musical Sensation of 1921 and All That Followed."